Locality: United States, Colorado, Garfield, White River National Forest, along Deep Creek near Ballixburg Spring (1.1 miles downstream of lower Short Creek confluence). Habitat: Flood plain of Populus angustifolia and Salix sp. with stream edge community of Picea pungens, Abies lasiocarpa, Acer glabrum, and Cornus stolonifera. Notes: Brickellia grandiflora, det. W. A. Weber 1995. 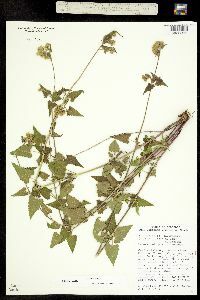 Originally ID as Brickellia cf. californica.